You are here: Home / Marketing / Is Twitter a waste of time for an email marketer? Is Twitter a waste of time for an email marketer? Has my entire marketing strategy for my books been wrong? But here's the catch… I was selling more books in March than I am now. In fact, I'm struggling to even give away free stuff to convert visitors to my site to my email list. John, Derick and I were kicking that around and trying to decide what is going on. Had I made a mistake by focusing a lot of my marketing energy on building a Twitter following instead of writing more blog posts to get organic traffic? John theorized that most of my “increase” in traffic has come from my stepped-up promotion of my old articles on Twitter. If that's true, it would make sense that I'm not getting a lot of email signups from the traffic to my blog, because these visitors already knew me, and probably most of them had already made a decision about whether to join my newsletter or not. The question gave me pause. If that was true, it meant I'd wasted a lot of time building my Twitter following when I should have just been blogging more. After the call, I decided to dig into my Google Analytics and email signup stats and see what was working and what wasn't. But, you might think, that makes perfect sense. 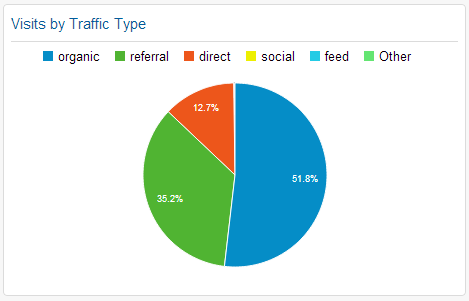 After all, it sounds like I'm getting most of my traffic from Twitter, not from organic search. And Twitter traffic is low quality when compared to organic traffic, right? Almost 52% of my traffic is coming from organic searches. And more than half of those visitors are landing on a long, detailed blog post that provides a step-by-step walkthrough that solves a common problem people have with Sublime Text. The average time a visitor spends on that page is more than 7 minutes. It's a content marketer's dream come true! And keep in mind that this is my best post ever. It currently receives around 5,000 page views a month–it's definitely a high performer. But even with all that traffic and a tailor-made giveaway that appeals specifically to visitors to that post (one of my favorite features of LeadPages, I'm still getting many more subscribers from Twitter each week than from a blog that's on track to receive 20,000 visitors this month. Content marketing is all the rage right now. Just give away all your best content for free, and people will love you and throw money at you. And that might very well be true in your market. But don't just assume that it's the best approach, or the only one that will work. For me, social media–Twitter in particular–has proven to be a more reliable source of new email signups than getting organic traffic through writing blog posts.